Man this was good. If you don't have a pasta machine and want to try this see if you can buy fresh pasta sheets from a deli. 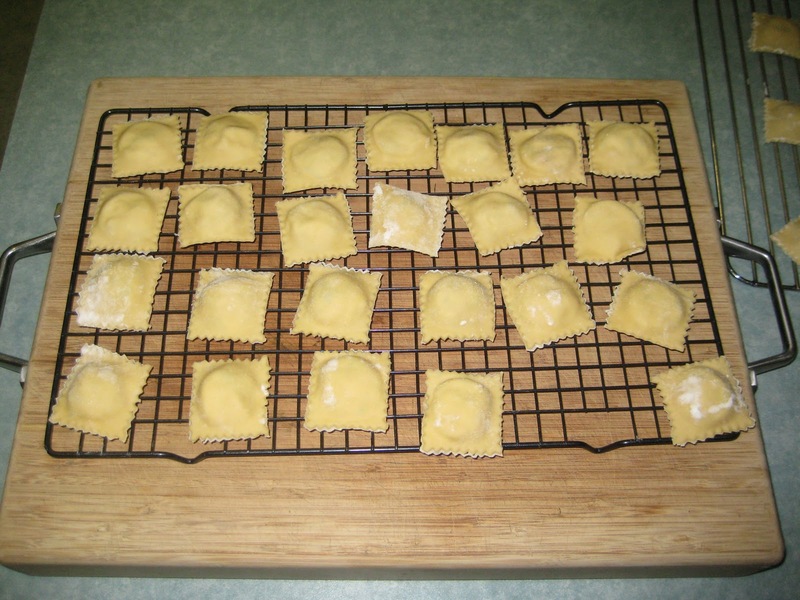 As you will see from the pictures, I fortunately have a ravioli press thing, it makes life much easier. If you can't get or make pasta sheets just mix the filling through some freshly cooked pasta and top each bowl of pasta with some of the butter gear. The amount of butter I used in this seems excessive but really, how regularly do you cook crab ravioli? The filling itself including chopping only took about 10 minutes to make and required no cooking. The order I completed this all in was to make the pasta and rest in plastic in the fridge - make the filling - roll out 1/3 of the pasta at a time and turn into ravioli - allow the ravioli to dry on a rack until ready (up to an hour) - boil water, cook ravioli and make butter sauce - eat. To make this go further, serve this with some salad or some nice crusty bread. Enough for 2 adults and 2 kids plus some left over crab gear. 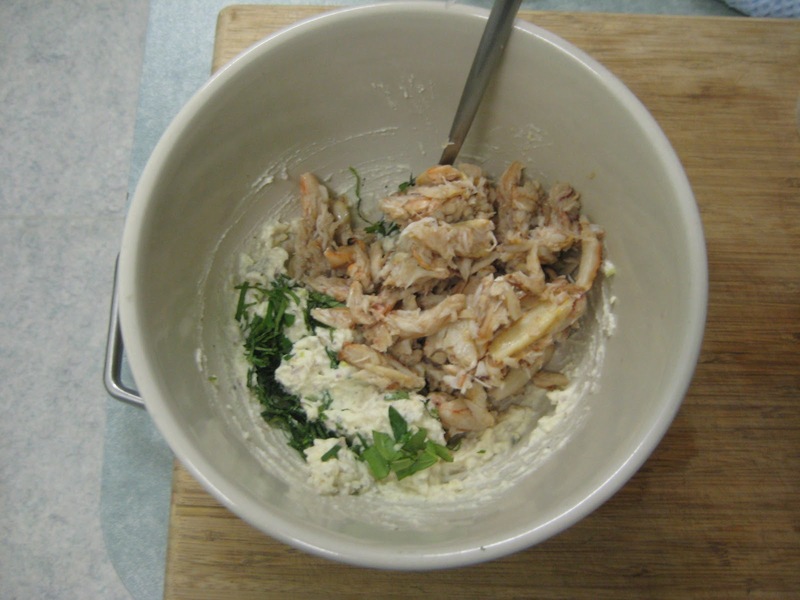 Combine the ricotta, 1/2 of the blue cheese, shredded basil leaves, shallot, salt and pepper, 2 cloves of freshly minced garlic and 1/2 of the lemon juice. Taste and add the remaining blue cheese (if you want), more lemon juice or salt and pepper as necessary. Add in the crab meat and combine breaking up the crab as you go. Add more ricotta if necessary. 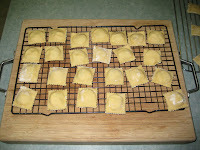 Lightly flour the ravioli tray and lay over half of a long sheet of pasta, press in the pasta using the mould. Spoon in 1 tsp of filling into each mould, lay the other half of the pasta sheet over the top and roll with a rolling pin to cut. Turn each out carefully onto a biscuit rack. Alternatively form the ravioli by hand. Boil enough salted water. When the water is boiling add in the ravioli and cook for 4 to 5 minutes after the water returns to the boil. While the ravioli is cooking melt the butter over a medium high heat with 1 tbs olive oil. When melted add in the garlic, remaining lemon juice, some salt and freshly cracked pepper and cook. By the time the garlic is fragrant the ravioli should be cooked. Drain the ravioli into a colander using a slotted spoon. 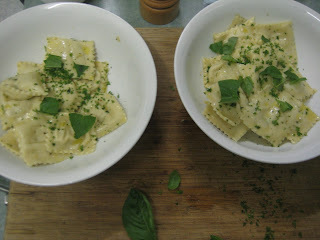 Add half of the parsley into the butter and toss, add in the ravioli and toss to coat. Pour the ravioli into bowls, sprinkle over the remaining parsley and some torn basil. Eat straight away.